COMMENTARY: Would Everyone Please Just Shut The Hell Up? Landmark Newspapers reporter Dustin Long wrote a fascinating article Wednesday, bringing to light documents filed by both sides in the NASCAR v. Mayfield suit, including e-mail transcripts between the attorneys for both sides that do little to enhance the reputation of the legal profession. In an e-mail to Mayfield’s attorney, NASCAR attorney Helen Maher outlined the fundamental difference between the two sides in recent weeks; the inability to agree on a lab to test Mayfield’s B Sample. Amphetamine is a byproduct of Adderall, while pseudoephedrine is the active ingredient in Claritin-D. Mayfield claims that test results have been falsely skewed by his use of prescription Adderall to treat a diagnosed case of ADHD, and Claritin-D for allergies. “LabCorp is not capable of conducting such testing,” wrote Maher. “Please confirm that you are refusing to select a laboratory that is capable of conducting the appropriate testing so that we can call the judge." Buric responded sarcastically, writing, "Blah blah blah. I did not say I would refuse to participate, I told you it was stupid to make the call. If you call the judge, patch me in. For the tenth time, we already selected the lab. Now for the eleventh time, all together now, "LAB CORP. is our lab of choice." With that kind of legal counsel advising him, it's no surprise that Mayfield’s recent remarks have been straight out of The Jerry Springer Show. Sadly, there is no sign that things will improve anytime soon. 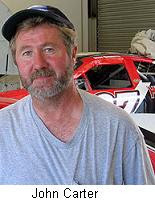 U.S. District Judge Graham Mullen set the Mayfield v. NASCAR case for jury trial beginning on September 13, 2010, leaving 14 long months for the rhetoric to continue. In addition, Lisa Mayfield filed a defamation lawsuit against her stepson Wednesday, seeking compensatory damages in excess of $10,000 and punitive damages in excess of $10,000. The suit results from comments made after Lisa Mayfield testified that she witnessed her stepson taking methamphetamine approximately 30 times between 1998 and 2005, that she witnessed him manufacturing the drug himself until the ingredients became too difficult to obtain, and that he used meth just days before an event at Darlington Raceway nearly a decade ago. Jeremy Mayfield has alleged that NASCAR paid Lisa Mayfield for her testimonony, calling her “a whore… (and) a gold-digger” and accusng her of playing a role in his father's death. Lisa Mayfield claims that she "suffered damage to her reputation as the result of the Defendant's defamatory statements ... and has undergone great mental suffering and emotional distress as a result of the Defendant's action in defaming her." The suffering of NASCAR Nation increases exponentially with every word uttered by anyone associated with this case. An internet report claiming that Reed Sorenson will be released by Richard Petty Motorsports as part of a downsizing of the team's Sprint Cup roster appears to be premature. The Ford Racing website dished a little dirt on the competition this week, reporting on rumors that Sorenson will be replaced by former Champ Car star A.J. Allmendinger when Allmendinger's #44 Dodge is mothballed within the next few weeks. However, a source close to the team -– speaking on the condition of anonymity –- said today that while the move is being discussed, Sorenson's release is not yet a done deal. "No one is sure that it's going to happen," said the source, "but it's definitely being talked about. The team is working on the details right now." If RPM does indeed decide to trim its roster from four cars to three, Allmendinger's current sponsors would transfer to the #43 Dodge. 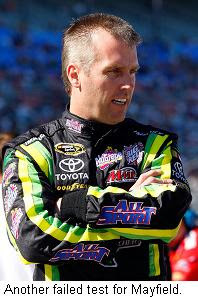 Mayfield Trial Date Set: A trial date has been set for Jeremy Mayfield's lawsuit against NASCAR. U.S. District Judge Graham Mullen has ordered that the jury trial begin on September 13, according to documents filed yesterday. Mayfield is currently suspended from NASCAR competition after a May 9 drug test allegedly revealed high levels of methamphetamine in his system. His suspension was lifted by Mullen last month, but reinstated by the 4th Circuit Court of Appeals last week. Mayfield is asking for reinstatement to NASCAR, and monetary damages. #26 Team Out At Roush Fenway: Roush Fenway Racing President Geoff Smith confirmed yesterday that the team’s driver lineup for 2010 has been finalized. After inking a partial-season sponsorship with Crown Royal for Matt Kenseth’s #17 Ford, Smith said, “Roush Fenway Racing's Sprint Cup driver lineup will see Greg Biffle, Carl Edwards and David Ragan joining Matt Kenseth to round out our four approved entries. We are still hoping to be able to transfer the #26 team intact to Yates Racing, in order to keep everyone employed and racing within the Ford community." Driver Jamie McMurray is rumored to be talking to Earnhardt-Ganassi Racing about the seat in their #1 Chevrolet next season. 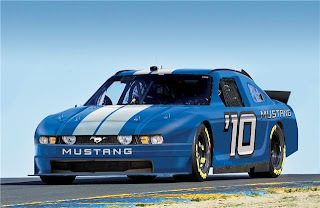 Ford Motor Company announced today that it will field the Ford Mustang in the NASCAR Nationwide Series, beginning with a limited rollout of the series’ new car in 2010. The Mustang is a legendary make in drag racing, road racing and drifting, but it has never competed in any modern-era NASCAR-sanctioned series. Ford Racing Communications Manager Kevin Kennedy told Sirius Speedway Tuesday that the new NASCAR Mustang will be more stock-appearing than the Sprint Cup Ford Fusion, adding that the appearance of the car was at the top of FoMoCo’s wish list. While declining to comment on the direction Chevrolet, Dodge and Toyota might take with their versions of the new Nationwide car, Kennedy confirmed that NASCAR would like to make the series a pony-car/musclecar-based platform. Ford Racing has already completed the official NASCAR submission and approval process for the new car, and production of Mustang parts will begin once templates are finalized. Teams are expected to begin building cars for testing later this fall. NASCAR says it has "a significant number" of witnesses who will testify to Jeremy Mayfield’s long-term and recent use of methamphetamine. Attorneys for the sanctioning body said those witnesses are reluctant to testify in the aftermath of disparaging comments made by Mayfield about his stepmother, Lisa Mayfield, after she said recently that she witnessed him snorting methamphetamine approximately 30 times over a seven year period. Mayfield called his stepmother “a whore” and “a gold-digger,” and accused her of murdering his late father. NASCAR also filed documents with the court Monday claiming that Mayfield lied to a federal court judge when he said a July 6 request that he report for immediate drug testing went directly to his voice mail. The sanctioning body says it has an audio tape of the conversation with Mayfield, in which he was instructed to report to a testing center and submit a sample. Mayfield has testified that he did not hear the message until 40 minutes later, making it impossible for him to meet NASCAR’s two-hour deadline to provide a sample. The sanctioning body is asking U.S. District Court Judge Graham Mullen to lift a July 1 injunction that allowed Mayfield to return to racing. No More Good Hands: Allstate announced yesterday that it will not return as title sponsor of the Allstate 400 at the Brickyard. The Illinois-based insurance company has served as title sponsor for the last five years, but its contract expires at the end of the year. Company spokesman Raleigh Floyd said the Allstate's decision was not a result of flagging attendance for this year’s event, but rather a desire to expand its Olympic and college football sponsorships. IMS spokesman Ron Green said the track was informed months ago of the decision. Lagasse Out At CJM: As Sirius Speedway first reported early last week, Scott Lagasse Jr. is out as driver of the CJM Racing #11 Toyota. Lagasse is currently 12th in championship points, but will be replaced by Denny Hamlin in a pair of upcoming events, with a full-time driver to be named later. Published reports say that Kelly Bires could run some races for CJM later this season, with America's Incredible Pizza Company remaining on the car only through this weekend’s race at Iowa Speedway. The company says it will continue its marketing campaign with Lagasse, prompting speculation that they and Lagasse could move to another Nationwide Series team for the remainder of the season. Yates Racing co-owner Max Jones says he plans to run at least two full-time cars next season, including the #98 Ford with driver Paul Menard and Menards sponsorship. Jones discounted reports that Menard might race elsewhere in 2010, saying that a deal is in place to retain both driver and sponsor. Jones said talks are underway about continuing the team’s partnership with Hall Of Fame Racing for another year, but that it is uncertain whether Bobby Labonte will return in the #96 Ford next year. Yates Racing could also absorb one of Roush Fenway Racing’s teams when NASCAR’s new four-car limit is implemented, and Roush Fenway President Geoff Smith revealed for the first time that Carl Edwards (Aflac), Greg Biffle (3M) and David Ragan (UPS) will definitely remain with the team next season. He said Matt Kenseth’s status depends on securing a new sponsor to replace the departing DeWalt, and that he would like to keep both Kenseth and Jamie McMurray in the Ford Motor Company camp, one way or another. Roush Fenway recently told McMurray that he is free to talk to other organizations, but Smith stressed that McMurray and his #26 Ford could still return to the organization in 2010. McMurray has reportedly been contacted by Earnhardt Ganassi Racing about replacing Martin Truex Jr. in the #1 Chevrolet after his contract expires at the end of this season. Edwards, Kenseth and Biffle all signed multi-year contract extensions with Roush Fenway last year. Crown Royal has two years remaining on its contract with the team, but could be moved to Kenseth's car if another backer is not found. Sources tell Sirius Speedway that while many options are still under consideration, the most likely scenario is for McMurray to drive the EGR #1 Chevy next season with sponsorship from Bass Pro Shops, with Crown Royal joining a new, partial-season sponsor on the quarterpanels of Kenseth's #17 Ford. Decisions Imminent At Red Bull: Red Bull Racing Vice President/General Manager Jay Frye left for Austria today for a series of meetings with team owner Dietrich Mateschitz that should finalize the team’s manufacturer and driver lineup for 2010 and beyond. Brian Vickers' contract extension is believed to be a formality at this point, but a well-placed sources within the team told Sirius Speedway today that a decision about remaining in the Toyota camp or jumping to Chevrolet “could go ether way.” Toyota is offering more in terms of financial support, but their engines still lag behind Chevrolet in terms of both horsepower and torque. Both manufacturers have offers on the table, and Mateschitz and Frye will weight both options before making a decision later this week. Mayfield Liquidates: Mayfield Motorsports is no more. Jeremy Mayfield liquidated almost all of the team’s remaining inventory last week, selling his transporter, six Toyota racecars and an inventory of parts to fellow team-owner John Carter. Carter fielded a former Mayfield Toyota for Terry Labonte at Indianapolis Motor Speedway yesterday, and Labonte will run at least four more times for the team at Michigan, Bristol, Atlanta and Charlotte. More races could be added, contingent on sponsorship. Four former Mayfield Motorsports employees – including crewchief Tony Furr – are now working for Carter, and while Mayfield said last week that a new, major sponsorship deal was “80-percent done,” Carter said he is not interested in having Mayfield drive for him. In his words, “that wasn't even discussed." Indianapolis Motor Speedway President and Chief Operating Officer Joie Chitwood will step down after this week's Allstate 400 at the Brickyard. Chitwood will become Vice President of Business Operations for International Speedway Corporation after completing his final day with IMS on Thursday, August 6. ISC has also announced that W. Grant Lynch Jr. will become Chairman of Talladega Superspeedway and Vice President of ISC Strategic Projects. Indianapolis Motor Speedway Corporation President and Chief Executive Officer Jeff Belskus will assume the daily responsibilities of managing the Speedway. It has not been determined if Chitwood will be replaced. "This is a disappointment for the Indianapolis Motor Speedway," said Belskus. "Joie provided the leadership you would expect for a facility that hosts the largest sporting events in the world. With his history in the sport combined with his business acumen, Joie was well-suited for the role of president of the Indianapolis Motor Speedway, and we appreciate how he has represented IMS. We wish him all the best." 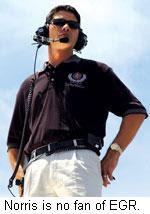 Chitwood joined the IMS staff as Senior Vice President of Business Affairs in October of 2002, and was promoted to President and Chief Operating Officer of IMS in December, 2004. His family connection to IMS dates to the late 1930s, when his grandfather began competing in the Indianapolis 500. 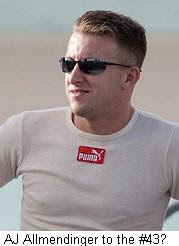 The three-ring circus surrounding suspended NASCAR driver Jeremy Mayfield has taken on a life of its own, dragging Mayfield and the sport itself into a Springeresque black hole of baseless accusations and mindless shouting. It all happened quickly; so quickly that many of us aren’t quite sure how we got into this mess, much less how to get out. Recall that on February 19th of this year, Mayfield Motorsports crewmember Paul Chodora was suspended indefinitely by NASCAR after violating the sanctioning body’s substance abuse policy. Mayfield responded with a glowing endorsement of that policy, saying, "Mayfield Motorsports respects the decision by NASCAR to indefinitely suspend Paul Chodora. We as an organization appreciate NASCAR's drug testing policies and policing efforts, as (they) make the sport stronger overall. If Paul doesn't comply with NASCAR's reinstatement process, then he will no longer be an employee of Mayfield Motorsports." Just five months later, Mayfield’s viewpoint has twisted 180 degrees. After once demanding that his employee follow NASCAR’s reinstatement requirements to the letter, Mayfield now refuses to do so himself. In his words, "I don't need to go to rehab, because I don't have a problem." After once applauding NASCAR’s drug enforcement effort for “making the sport stronger,” Mayfield now alleges that it is fatally flawed by design, and even corrupt in its execution. After initially basing his defense on the possibility of a laboratory mistake, Mayfield now accuses NASCAR of intentionally “spiking” his urine sample in an effort to drive him out of the sport. No evidence has been offered to support those claims, and one can only wonder how his attorneys feel about their client undermining their carefully crafted defense with an escalating series of wildly outlandish claims. Mayfield questions the veracity of NASCAR’s official laboratory, Aegis Labs. He claims to have undergone approximately 15 drug screenings since his suspension, with only the NASCAR-mandated tests producing positive results. 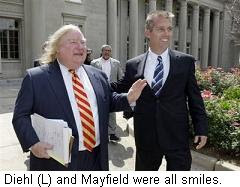 Unfortunately, all we have is Mayfield’s word on that, since virtually no documentation has been produced. He and his attorneys did produce a test from a company called LabCorp this week, showing no discernable levels of methamphetamine in the subject's system. Unfortunately, Mayfield’s name does not appear anywhere on the document. In addition, the test results found no amphetamine levels in the sample. Amphetamine would almost certainly be present in a subject who -– like Mayfield -- is taking prescription doses of Adderall for a diagnosed case of ADHD. What specific tests were performed by LabCorp, and by whom? Were proper procedures followed? At present, we just don’t know. If Mayfield has indeed passed more than a dozen drug tests, he and his attorneys should do what NASCAR has done; entering the complete results of those tests into the court record, and answering all questions about where, when and how those tests were conducted. More than a week ago, NASCAR requested that Mayfield and his attorneys select a laboratory to test the B sample from his latest (July 6) drug test. That test has still not been performed, because none of the labs chosen by Mayfield are able to distinguish between methamphetamine and the combination of amphetamine (Adderall) and pseudoephedrine (Claritin-D). If Mayfield is as clean as he claims to be, he should welcome to opportunity to show the world exactly what is -- and isn’t -- in his system. His refusal to do so raises serious questions about his innocence. I want to believe Jeremy Mayfield. I really do. He’s been a frequent guest and good friend to Sirius Speedway over the years, and never impressed me as a guy wandering around with a snoot full of meth. But these days, I’m not sure what to think. It’s all become so… bizarre. Just minutes after talking about the “humiliation” of peeing in a cup in front of medical professionals, Mayfield announced that he has a full-time video crew documenting every minute of his life; presumably even in the loo. Days later, he called stepmother Lisa Mayfield – who testified that she saw her stepson snorting methamphetamine at least 30 times over a seven-year period -- “a whore” who “shot and killed” his father, Terry; officially a 2007 suicide victim. He vowed to serve Lisa Mayfield with a wrongful death suit last Thursday, then didn’t. 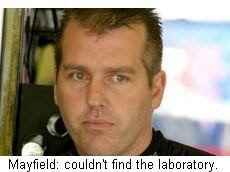 I’ve looked everywhere I can think to look, and found no evidence to support anything Jeremy Mayfield says. No proof, no documentation, just a series of wild accusations from a man who seems to be spinning further and further out of control. It’s all terribly sad, and it’s becoming harder to believe every day. NASCAR filed documents in District Court this week asking the judge to vacate his July 1 order allowing Mayfield back behind the wheel of a NASCAR Sprint Cup Series racecar. The filing included a large amount of new evidence, including documents claiming that Mayfield once again tested positive for methamphetamines in a screening conducted last week. NASCAR’s attorneys claim that additional tests were performed on Mayfield’s latest urine sample; tests which rule out the possibility of an Adderall/Claritin D mixture being mistaken for methamphetamine. They also claim that Mayfield’s latest sample was “very dilute,” alleging an excessive consumption of water by Mayfield in an deliberate attempt to defeat the test. The filing contends that the levels of methamphetamine in Mayfield’s sample are consistent with those seen in habitual users who consume high doses of methamphetamine, develop a tolerance for the drug and therefore do not display outward signs of drug use. Mayfield accused NASCAR of being unwilling to consider the possibility of his innocence, saying, “they have a hard time admitting when they're wrong or done something wrong. We all know that, whether we admit it or not. It's just part of the battle, part of the things we're going to have to fight." As part of NASCAR’s filing, Mayfield’s stepmother, Lisa Mayfield, testified that she has direct knowledge of Mayfield’s drug use dating back to 1998. In an affidavit, Lisa Mayfield testified that she witnessed her stepson using methamphetamine approximately 30 times over the years, including at least once before a race. She testified that Mayfield “cooked” his own methamphetamine until it became too difficult to obtain the ingredients, then began purchasing the drug directly from dealers. Sports Illustrated is reporting today that Kevin Harvick has asked Richard Childress to release him from his contract one year early, at the end of this season. SI cites multiple sources saying that Harvick hopes to jump to Stewart-Haas Racing next season, where Tony Stewart has said his team would field a third Sprint Cup entry, if sponsorship is available. The report claimed that Harvick will take his sponsor with him to Stewart-Haas Racing, when Shell-Pennzoil’s deal with RCR expires at the end of the season. RCR spokesman David Hart disputed that claim, however, telling Sirius Speedway via e-mail that Shell’s contract with RCR extends through the 2010 campaign. Our sources say that while Harvick is indeed talking with both Stewart-Haas and Childress about changing teams next season, Shell-Pennzoil is not a part of the equation. If Harvick changes teams next season, it will likely be with the backing of Jack Daniel's, which currently backs RCR driver Casey Mears. Hart said that RCR is “currently in negotiations with Jack Daniel’s to extend its current contract” beyond the 2009 season. 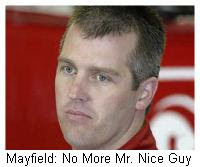 Mayfield Has A Backer: Jeremy Mayfield has a sponsor for next weekend’s Allstate 400 at the Brickyard. SmallSponsor.com owner Robert Craddock said late last week that he believes Mayfield is innocent of the substance abuse charges leveled against him by NASCAR, and is negotiating with a Fortune 500-level company to join him in sponsoring the Mayfield Motorsports #41 Toyota. If necessary, Craddock said he has the means to back Mayfield himself. 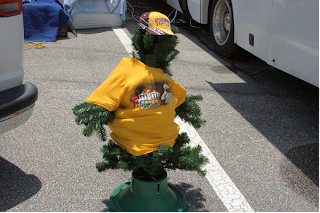 Loyal listener Ed Carpenter spotted "The Shrub" in the infield at a recent Sprint Cup race. Who says today's drivers don't mingle with the fans? Race fans, your complaints have been heard. Last weekend, Chicagoland Speedway hosted the NASCAR Sprint Cup Series “Lifelock.com 400” before a less-than-capacity crowd. Since NASCAR first visited Chicagoland in 2001, seven of the track’s eight Sprint Cup races have been sellouts. The other -- in 2007 – had only a few of the track’s 75,000 seats unsold. Last Saturday night, there were large chasms of empty seats on both ends of the grandstand. In addition, some fans complained they were denied an opportunity to purchase single-day tickets to the event, being told instead that they would have to purchase a “Track Pack,” which includes tickets for other race events at the speedway. Ranging in price from $195 to $260, Chicagoland Speedway’s “Track Pack” included tickets for the weekend’s NASCAR Nationwide and Sprint Cup Series events, as well the August 28 NASCAR Camping World Truck Series race and an August 29 appearance by the IRL IndyCar Series. The Joliet oval is not alone in selling combo ticket packages. In fact, a number of tracks that host the NASCAR Sprint Cup Series do business the same way. In 2010, however, Chicagoland Speedway -- and its sister International Speedway Corporation facilities -- will consider abolishing the “Track Pack” requirement, allowing fans to once again purchase tickets for individual events. One year ago, Brad Keselowski was under consideration for a full-time ride in the NASCAR Sprint Cup Series. 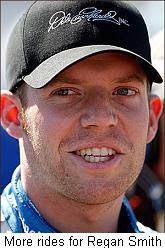 He eventually signed for a full season of Nationwide competition with JR Motorsports, and a handful of Cup starts with both Phoenix Racing and Hendrick Motorsports. This time around, Keselowski is the belle of the Sprint Cup ball, with at least three major teams reportedly vying for his services. 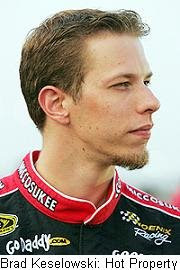 FOX Sports reported today that Keselowski is “the top candidate” for Penske Racing’s #12 Dodge, replacing David Stremme. After doing yeoman work as Penske’s test driver a year ago, Stremme currently stands 32nd in Sprint Cup points, prompting speculation that a change could be in the works. Keselowski was reportedly offered the Penske ride a year ago when Ryan Newman left the team for his current spot at Stewart-Haas Racing. 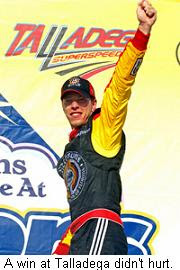 Keselowski is also being linked with Red Bull Racing, if Red Bull jumps from the Toyota camp to Chevrolet next season. Rick Hendrick said Saturday that Hendrick Motorsports has the resources to provide engines to Red Bull next season, and Red Bull General Manager Jay Frye is set to meet with team owner Dietrich Mateschitz this week to finalize their driver and manufacturer lineup for 2010. Recent reports in the Indianapolis Star had Keselowski going Cup racing with JR Motorsports next season, but Dale Earnhardt, Jr. downplayed those chances, saying there is "only a 10 percent chance" of JRM changing series in 2010, and then only if he drove the car himself to attract sponsors. Keselowski is expected to return for a full Nationwide slate with JRM in 2010. Terry Returns (Pending Sponsorship):Terry Labonte will team with Boris Said and Carter-Simo Racing beginning at Indianapolis Motor Speedway, and for the remainder of the 2009 NASCAR Sprint Cup season. Labonte is set to wheel a #08 Toyota Camry in selected events for the team, with Said driving a #08 Ford in the remainder of the schedule. The team is searching for sponsorship. #1 Chevy Too High: Martin Truex Jr.’s Bass Pro Shops Chevrolet failed a post-race inspection after a 16th place finish Saturday night at Chicagoland, when its right-rear quarterpanel was found to be too high. The car has been taken to NASCAR’s Research and Development Center in Concord, N.C., for further examination, with penalties (if any) likely to be announced on Tuesday or Wednesday of this week. Jeremy Mayfield broke his long silence yesterday, speaking to ESPN.com’s Marty Smith and vowing to fight NASCAR every step of the way to regain his career and reputation. Mayfield said, “Every time there's an action (by NASCAR), there's going to be a reaction from here on out. I try to be nice. I try to be respectful to them. I try to do everything right. But I'm not getting drug through the mud no more." He said believes NASCAR is trying to make an example of him, challenging NASCAR CEO Brian France’s assertion that other drivers have failed substance abuse tests this season, but been cleared after conversations with their doctors. He also questioned France’s assertion that there is a list of substances banned by NASCAR, saying, “Now there's a list -- an exhaustive list. Right? Where's it at? It's bull----, man, and somebody needs to stand up and see through this." “I'm just tired of it,” he said. “Mentally. Personally. I go try to find a sponsor, (and) nobody will talk to you. Try to find a ride, nobody will talk to you. So then what do I do? 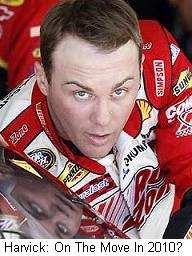 I'm not going to sit here anymore and get slammed by (NASCAR)." NASCAR spokesman Ramsey Poston said Mayfield has nobody but himself to blame for his current situation, adding, "Whatever happened to personal responsibility? Jeremy Mayfield is the one who tested positive for methamphetamines. He's the one who violated the substance abuse policy, and he's the one that put the other competitors and fans at risk. The judge's order is quite clear: Mr. Mayfield will have to comply with whatever drug-testing requirements are imposed… on him, and continue to do so." In a related story, Mayfield’s wife, Shana, said they are considering selling their race team after being unable to secure sponsorship. She said they do not have the cash to field a car themselves, and are "looking at all options,” including the sale of the team’s assets. In an effort to increase the level of understanding of the process, Sirius Speedway has consulted with a number of medical professionals to determine what specific tests and procedures Mayfield is likely undergoing, and what they mean. In cases like this, "witnessed samples" -- where the subject is observed urinating into the sample container -- are not unusual. In fact, they are the norm. While almost certainbly uncomfortable for the test subject, "witnessed samples" are not unusual in this type of case. Acquisition of urine samples is not a sterile procedure, so it makes no difference where the sample is taken, so long as it is witnessed and all parties sign off on the sample as it is taken. The experts say that NASCAR is now almost certainly conducting more comprehensive tests on Mayfield than their initial screening. In most cases, the preliminary drug screening tests only for three basic types of drugs. When a positive result is found, the next step is usually to administer a “Drugs of Abuse Screening” which searches for drug groups: amphetamines , cannaboids, cocaine, opiates, phenycylidine, ecstacy, LSD, club designer drugs, heroin, prescription drugs prescription drugs of abuse, anabolic steroids, etc. This test reveals specific drugs in the subject’s system -- and equally important – their levels of concentration. NASCAR's chosen laboratory will almost certainly follow "chain of custody of evidence" with the urine sample obtained from Mayfield on Monday, documenting each step in the process and maintaining a chain of evidentiary possession to prove that his sample was not tampered with or contaminated in any way. When Mayfield produced his latest sample, NASCAR (or its laboratory) almost certainly required him to provide complete, written documentation of any and all medications he is taking; complete with name, dosage and last time taken. Medications have what is called a "half-life" and medical professionals can look up any medication and determine -- according to its half-life -- the approximate duration of effect for that drug. When results are obtained from Mayfield's most recent screening -- likely in 3-4 days -- a toxicologist can review the concentration of each compound in his system and tell when it was ingested and how much was ingested. Virtually every drug leaves a footprint in a person's system, revealing it’s specific chemical makeup. There are obviously variables in any test, but there are parameters and fail-safes built into the drug-screening process to deal with those variables. When there is a question surrounding the results of a specific test, the laboratory can simply obtain a new sample and re-test. 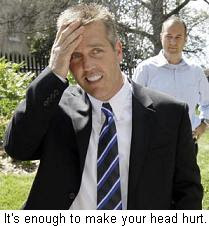 Just when you think things can't get any more bizarre, the Jeremy Mayfield saga takes another turn toward the absurd. NASCAR spokesmen said today that Mayfield submitted to a drug test Monday, but only after delaying that test for seven hours. NASCAR's Ramsey Poston accused Mayfield of intentionally attempting to avoid the test, but Mayfield’s attorney, John Buric, said the delay resulted from confusion over the location of the testing laboratory. Poston said Mayfield was contacted at 1:18 p.m. Monday and told to report to a specific laboratory to provide a sample; procedures outlined in NASCAR’s drug testing policy. That call triggered a veritable Keystone Kops series of events that strains the bounds of believability, no matter whose version you prefer. Attorney Buric said NASCAR’s initial phone call went to Mayfield’s voice mail and was not received for more than an hour. Unable to reach NASCAR’s approved laboratory within the specified two-hour time frame, Buric says Mayfield was told to report to a closer lab, but was unable to find it. After being unable to contact personnel at the second lab to get directions, Buric says he directed his client to go to his own laboratory to provide a urine sample. NASCAR subsequently sent lab technicians and a security official to Mayfield’s home, and were able to obtain their own sample after an additional one-hour delay; at approximately 8:20 p.m.
Buric blamed the additional delay on NASCAR’s insistence that Mayfield be observed while providing the sample to ensure it was his; a requirement Buric called, “outrageous and…intentional.” He accused the sanctioning body of “mak(ing) the rules up as (they) go along” and of intentionally harassing his client. Michael Waltrip Racing General Manager Ty Norris offered up some scathing commentary on his former team yesterday. Asked about Martin Truex, Jr.'s recently announced jump from Earnhardt-Ganassi Racing to MWR, Norris said, “Martin’s loyalty has kept him where he currently sits for a couple of years too long. That is an organization that has been in flux every year that he has been driving for them. In 2007… the whole season was about Dale Jr. leaving. In 2008, it was about the merger with Ginn. And this year, it was the merger with Ganassi. Despite numerous reports to the contrary, Truex said he remains committed to Earnhardt-Ganassi through the end of the season, a fact that DEI General Manager Jeff Steiner confirmed in an exclusive interview with Sirius Speedway yesterday. There are reports that Truex’s longtime crewchief, Kevin “Bono” Manion, will join his driver at MWR next season, but Steiner said he expects Manion to remain in his current position. No Hard Feelings: Tony Stewart says he spoke to Kyle Busch yesterday, and that there are no hard feelings following their last-lap crash in the Coke Zero 400 at Daytona. He said the two agreed that the crash was nothing more than a racing incident, and will move on to Chicagoland Speedway Saturday night with a clean slate. More Races For Smith: Furniture Row Racing Team Manager Joe Garoni says the team hopes to add races to its 2009 schedule soon. "We're looking at adding some more races as we move forward," said Garone, "and we're working hard to get sponsors to run a full season next year.” Driver Regan Smith was originally scheduled to run just 12 races this season, but the 2008 Raybestos Rookie of the year told Sirius Speedway Monday that the team has already decided to add the August 22 race at Bristol Motor Speedway to their schedule. Michael Waltrip Racing announced today what Sirius Speedway first told you two weeks ago; that Martin Truex, Jr. will join their driver roster next season at the wheel of a new, NAPA Auto Parts-sponsored #56 Toyota. In addition, NAPA has signed a multi-year contract to continue as primary sponsor of the team. Michael Waltrip will drive a limited schedule next season -- beginning with the Daytona 500 -– in his familiar #55 NAPA Toyota. Owner points earned by Waltrip this season will transfer to Truex's full-time effort in 2010. Truex has 135 career Sprint Cup starts, with one win, 12 Top-5 and 36 Top-10 finishes. He currently stands 24th in points at the halfway mark of the 2009 campaign. Earnhardt-Ganassi Racing General Manager Jeff Steiner will join us live at 6:15 PM ET today to discuss the loss of Truex, and what it means to his team. ISC Announces Revenue Plunge: International Speedway Corporation has reported a 13.6 percent drop in revenue for the first six months of this year, most of it attributed to a $55.6 million write-down for merchandise vendor Motorsports Authentics. The company’s financial statement also showed a drop in admissions revenue of 16.5 percent, and ISC President John Saunders said he expects overall admissions revenue to drop 15 percent for the year. Advance ticket sales are down approximately 25-30 percent, as fans wait until later to buy tickets. ISC had a net loss of $6.5 million for the first half of the year, compared to a $62.25 million profit in the first half of last year. NASCAR Still Valuable To Automakers: A report in this week’s edition of Brand Week magazine shows once again why automakers see value in NASCAR. The report cites statistics from Nielsen Media Research – the people in charge of determining television ratings – and MRI's Survey of the American Consumer showing that NASCAR fans are extremely patriotic about their cars and trucks. Data acquired from NASCAR viewers in the first quarter of this year showed that they are more likely than average consumers to drive an American-made vehicle. NASCAR fans were 70-percent more likely to drive a Chevrolet than non-NASCAR fans. They were 64-percent more likely to drive a Ford than non-NASCAR fans, and Dodge’s numbers were plus-59 percent. New Arrival: Congratulations to Matt and Katie Kenseth, who welcomed Kaylin Nicola Kenseth to the family Monday. Matt also has a son, Ross, from a previous relationship. Mom and baby are doing fine, Dad’s a little shaky. 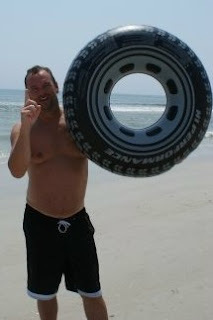 MRN Radio's Jeff "Shamu" Streigle hoists the championship trophy after winning the Third Annual World Body Surfing Championship in Daytona Beach, FL, Saturday. The wily veteran overcame a near career-ending crash in last year's event to climb to the pinnacle of competitive bodysurfing. Congratulations, Jeff! 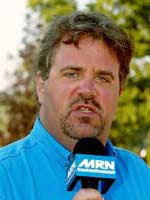 Thanks to Kim Roberson of InsiderRacingNews.com for the photo. Dale Earnhardt Jr. said Friday that he doubts his JR Motorsports team will move to Sprint Cup competition in 2010. An online website reported last week that Earnhardt could be shuffled to JR Motorsports next season to make room for Danica Patrick in the Hendrick Motorsports stable, but Earnhardt said it would be "quite a challenge for anybody to find the kind of financial support you need" to move the team from Nationwide to Sprint Cup competition. It would also reportedly require team co-owner Rick Hendrick to divest his ownership stake, in order to comply with NASCAR’s four-car ownership cap. Mayfield Back in Chi-Town? : Crewchief Tony Furr says the Mayfield Motorsports team could be back on track with less than two days notice. Furr and the rest of the team were laid off in the aftermath of Mayfield’s suspension from NASCAR, but said Saturday that if the sponsorship is there, the team can be reassembled quickly. “All the stuff is still there at the shop," he said. "We're a day-and-a-half away from having (the car) ready to go. I could have a team in place in less than an hour. Mayfield Motorsports has not competed since the Coca-Cola 600 at Lowes Motor Speedway on May 24. In an open letter to fans, friends and fellow competitors, Mayfield said he is working around the clock to try and secure the funding needed to take part in this weekend’s race at Chicagoland Speedway. PRM/Dodge News: Richard Petty said Friday that Chrysler is working on a plan to pay some of the money it owes Richard Petty Motorsports. After seeing the cash pipeline shut down in recent weeks, Petty said all parties are working to determine what Chrysler can do to help eliminate the past-due balance. RPM is in the final year of its contract with Dodge, and Petty said he is open to talking with other manufacturers about 2010 and beyond. Leffler's `09 Schedule Trimmed: Braun Racing has announced that Great Clips will remain on board as sponsor of its #38 NASCAR Nationwide Series team for the next three seasons. Jason Leffler will drive the #38 Great Clips Toyota Camry in 27 of the 35 races, with Kasey Kahne running the remaining eight. Leffler is currently fourth in Nationwide points, trailing only Kyle Busch, Carl Edewards and Brad Keselowski. A total of 45 transporters rolled through the tunnel at Daytona International Speedway this morning, but Mayfield Motorsports Inc., was not among them. NASCAR spokesman Ramsey Poston said Mayfield Motorsports has until 3 p.m. ET today to present a car for competition, and with less than two hours remaining, our sources at the speedway say he has not yet done so. The hype surrounding Mayfield threatened to cross the line into outright silliness earlier today, when the Associated Press ran a breathless story announcing that team owners Larry Gunselman and Tommy Baldwin will not put Mayfield in their cars this weekend. That really came as no surprise, since veteran Mike Wallace was already entered in Gunselman’s #64 Toyota, with Patrick Carpentier slated to steer Baldwin’s #36. Gunselman said that his sponsor wants no part of the controversy surrounding Mayfield, while Baldwin pointed out that he already had a driver for the weekend; Carpentier. In a related (and equally vapid) story, Hendrick Motorsports, Roush-Fenway Racing and Joe Gibbs Racing all revealed today that they have no plans to replace any of their drivers with Mayfield, either. U.S. District Court Judge Graham Mullen has granted Jeremy Mayfield’s request for a preliminary injunction, a decision that forced NASCAR – at least for now -- to lift his indefinite suspension for testing positive for a banned substance, reportedly methamphetamines. That ruling does not necessarily mean that Mayfield will take part in Saturday night’s Coke Zero 400 at Daytona. NASCAR is entitled to appeal the ruling to the U.S. Court of Appeals in Richmond, Va., though spokesman Ramsey Poston said NASCAR does not plan to appeal, and will abide by the judge's ruling. NASCAR also raised the spectre of Mayfield’s fellow drivers refusing to compete if he is on the track. “If other drivers refuse to race, it will harm the relationships that NASCAR has developed with its drivers, fans, sponsors and broadcasters over the last sixty years." In his ruling, Judge Mullen said, "The harm to Mayfield substantially outweighs harm to NASCAR." He also ruled that Mayfield is subject to whatever drug testing NASCAR deems fit. NASCAR’s Poston said Mayfield will be tested on a regular basis.